The Sword of Summer by Rick Riordan. 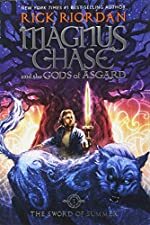 Book 1 in the Magnus Chase and the Gods of Asgard Series. Review: Do you like books full of adventure and excitement? What about books with humor and cool characters? Then you will love the book The Sword of Summer by Rick Riordan about a boy named Magnus Chase. Magnus needs to go on a mission to keep a monster from getting free and destroying everything. He needs assistance from the Norse gods on his journey. He makes other new friends to help him on his journey as well. There is one big problem though, Magnus just died. The Sword of Summer is a book primarily intended for middle schoolers, however teens and adults would enjoy it as well. The Sword of Summer is a novel with harder words and no pictures. The Sword of Summer has many suspenseful situations and scenes full of action. I believe the moral of this story is that having help in something you need to do is easier than doing it alone. I really enjoyed reading The Sword of Summer and I think it is you will like it too. Review written by Jessica (6th grade student). We would like to thank Disney-Hyperion Books for providing a copy of The Sword of Summer for this review. Have you read The Sword of Summer? How would you rate it?